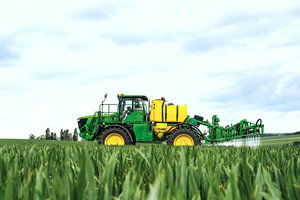 The John Deere 4000 Sprayer was one of several products that received nominations this year. EquipmentWatch, a heavy equipment data and software company, has announced its nominees for the annual Highest Retained Value Awards, and John Deere leads the pack with 26 nods. The closest competitor trails Deere by four in second place. The awards are designed to recognize manufacturers in 30 equipment categories, ranging from agriculture to construction. Winners are selected based on how their products have retained their value over the last five years. This year, corn headers and tandem compactors are also being considered as a part of the judging. Deere was nominated in categories including balers, sprayers, tractors, and excavators. Some of the products that received nominations include the Deere 160 excavator, Deere 544 loader, Deere 600 combine and Deere 4000 sprayer.